We totally suggest you take a look to the following associations and activists' campaigns who fight for a better world all around the planet!!! A great foundation thanks to which a 100% of the money raised goes to charity!! A marvellous tale for you children but also for adults!!!!!!! The globalization of trade sparked a new food environment worldwide. Food environments traditionally based on locally procured items have expanded to offer a wide array of options from every corner of the earth. An increasing number people no longer eat to live but rather live to eat. Whereas girth was once considered a sign of wealth, it may now be a risk to one’s health. But amidst all of these delectable options, do you always need to choose the healthy item? When and how often is it ok to indulge? Obviously, eating is necessary to sustain life – we have to eat in order to get energy, vitamins, minerals and other micronutrients that enable our cells to function normally. But there’s more to it than that. There are many reasons to eat healthy, but the biggest and most obvious is that you’ll feel better. You’ll feel happier, more energetic, and more able to focus your attention. 1. Eat a variety of nutrient rich foods (aka get your fiber and vitamins). We were all taught the 5 food groups (fruits, vegetables, dairy, proteins, grains) so you probably have a basic understanding of your needs. Have a variety of different colored fruits and vegetables, eat lean proteins, choose low fat dairy, and select whole grains. There is no single food that is nutritionally leaps and bounds above its counterparts. 2. 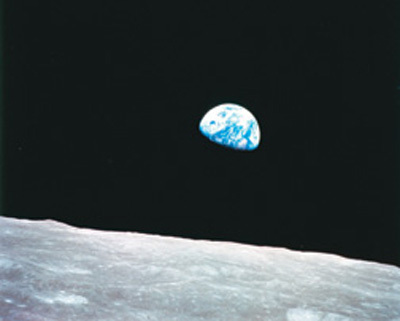 Eat as ‘close to the earth’ as possible (aka reduce processing). When a new ‘magic’ extract from the pituitary gland of jumbo shrimp hits the market this fall, don’t jump on it. You don’t need it. Eating is much more intuitive than laboratory synthesized (or even than highly processed) foodstuff. Foods with less processing, grown organically, or raised naturally are generally good selections. 3. Eat moderate portions (aka don’t overeat). You can indulge in any of the highly refined treats that you want, but, they should be treats – consumed occasionally in small portions. We’re all allowed a certain number of discretionary calories – calories needed to maintain our weight but that don’t have to be healthy if the other foods we’re eating are nutrient rich. 4. Maintain balance (aka be aware of what you eat). Every food, every meal, and every day doesn’t have to be a succession of “perfect” foods. Instead, balance your choices. If you didn’t eat any green vegetables today, have some tomorrow and don’t worry about it. 5. Enjoy your food (aka derive pleasure from eating)! People who savor their food and don’t rush though meals tend to be more satisfied. It takes 20 minutes for your brain to sense that your stomach is at a comfortable fullness, so slow down when you eat, have lots of water and enjoy it. Learn to love the food you eat and eat the foods you love. Oh, and for the record, shrimp don’t have pituitary glands – don’t buy into the marketing schemes! You’re smarter than that and a more sensible eater. Sri Venudas is born in 1970 in Keralam, Southern India. He started his studies at the tender age of 3 years old under his Guru and grand-father: Sri Vasudeva Perumal. He learned both Yoga & Music through a traditional way « Guru Kula» : transmission from Guru to disciple. Living by his grand-father in the forest, he learned the yogic way of life near the nature. His knowledge is deeply rooted, with tolerance and intuition. He began to teach at the age of 14 years old in India and still continues in his country and all over Europe and America for the last 28 years. Nowadays he is based in Paris where he transmits Hatha Yoga and Southern Indian Classical Music. After all these years of observing and teaching, his transmission is imbued with kindness and generosity. practice, meditation and mantra singing. vegetarian food during this 7 day practice. All participants need to arrive at least one day before the beginning of the workshop to take the necessary time to settle and have a first meeting with the island and its particular natural environment. There will be a meeting of all participants with the teacher in the evening of the 2nd of August.The opening ceremony begins at 08.00 in the morning of the 3rd of August. The practice of the group will be in the nature. Samothraki is a beautiful, particularly green greek island with rich vegetation and wild nature. It is situated on the northern aegean sea. The Saos mountain, where according tothe ancient legends Poseidon used to sit to watch the Trojan war is the highest peak of the aegean sea and gives birth to many little rivers and waterfalls with crystal water. This island with few sandy beaches, it is mostly known for the beautiful lakes and waterfalls. Gods that took place in the island, called “Kaviria Mistiria”. Those were the only mystic ceremonies of the antiquity open to all - men, women, greek and non greek people. 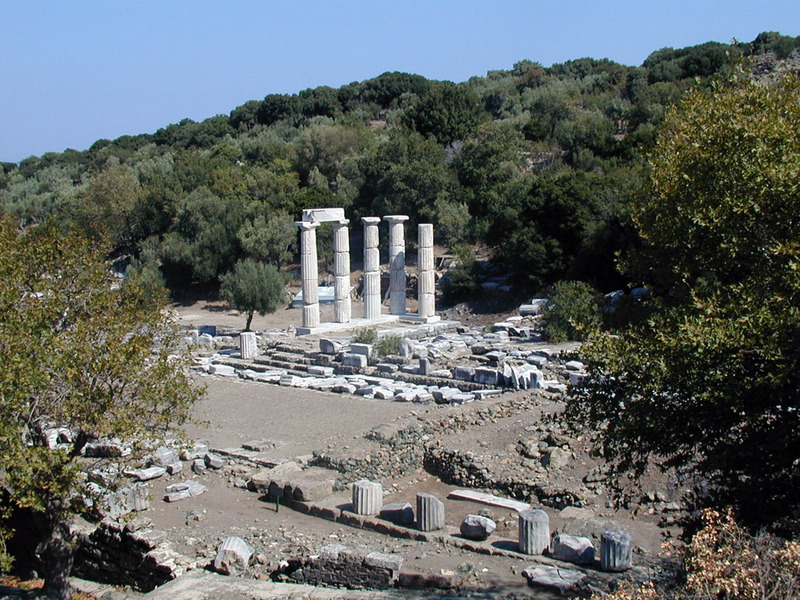 Olympiada, Alexander the Greatʼs mother is said to have conceived her son during one of these ceremonies.Samothraki is difficult to reach, and its wild nature attracts mostly ecotourists and discourages the city people from going. This makes the island a precious destination for a peaceful retreat near the nature. The yoga practice will be in the nature, near the Free Municipality Camping of Samothraki;which is a forest area near the sea where you can camp with your own tent. The camping provides water and showers. 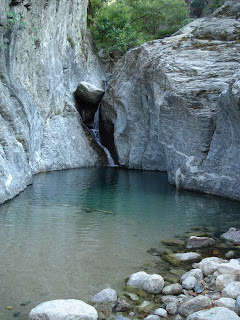 Next to this camping is situated the Organized Municipality Camping of Samothraki; whichalso provides electricity and more comfort. We clearly recommend the Free Camping area, where you can camp in the forest. The Workshop activities will be happening around this area. Prices are around 3 euros per day for adults and 2,5 - 4 euros per day for a tent, depending on the size of the tent. You can find here some links with photos of the camping and additional information. There is also a possibility to rent a room, the village of Therma which is situated 15 minutes on foot from the camping. The participants will be free to eat wherever they want for lunch. There are many beautiful taverns on the island, you can also cook in the camping if you have the necessary equipment. The workshop organization team will arrange for a vegetarian meal in a beautiful tavern of the island, for a “Menu” price. Dinner will be cooked after the evening meditation, by the fire next to the seaside with the participation of everyone. We bring the ingredients, we prepare the food and eat together. - Take a plane to Alexandroupolis (Olympic or Aegean airlines, escale in Athens) and then take the boat to Samothraki (3 hours). - Get a plane to Thessaloniki; then take the train or a bus to Alexandroupolis (4-5 hours);then take the boat from the port of Alexandroupolis to Samothraki (3 hours). 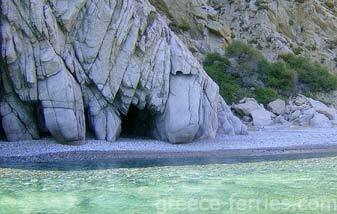 then take the boat from the port of Alexandroupolis to Samothraki (3 hours). The boat to Samothraki leaves from the city of Alexandroupoli everyday. The cost of the ticket is approximately 15,10€ fixed price. are fixed and you can buy your ticket at the guichet some days before your journey or the same day. There is recently a system to buy online tickets but this is not a common practice. The beautiful landscape will reward you. It’s the height of the dry season, and things are getting pretty dusty around here. There seems to be no way of keeping the kids clean, short of keeping them indoors, which frankly, would be too cruel when there is so much nice, chocolate colored dirt around to play with! 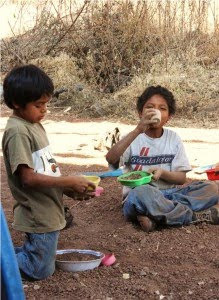 They also love grinding different rocks and bricks into “chile” powder, and playing “restaurant” with it, but after an hour of two, they are hardly recognizable! Our teen boys have been diligently building a cement paved bike track, advancing a few meters a day. It's hard work though, so thankfully our recently returned volunteer, Kao, has recruited all the younger boys to join in too, and they are advancing at triple speed. Since everyone is into riding bikes, we can’t wait until it’s finished. Many of the girls also recently received a donation of bikes from friends and family. Thank you Pimi Gill, Tina, Kao and family for their great bikes! A couple of months ago the children were fast asleep, when smoke from a nearby forest fire forced us into an emergency evacuation of the entire orphanage! As ambulances and police trucks poured into Tashirat, the children huddled together in their pajamas, wide eyed, watching the mountain close behind our bungalows smolder. We piled them and their bedding into the awaiting rescue vehicles, and were taken to our friends Anneke and Adrian’s house. When we arrived at our friends’ house, there were loads of beds already laid out, but the kids were having so much fun by then that it felt much more like a pajama party than an emergency evacuation! The next morning, the smoke was better but the kids were having too much fun playing in our friends’ garden and enjoying their gracious hospitality to want to go home. Other exciting news: we received a new little girl in February, and a new little boy just last week! The girl’s name is Joline and she is 4 ½ years old. She was abandoned when she was two years old, and has spent the last two years living in the big government foster home in Cuernavaca. Jolie was very timorous and insecure, and spent the first few days here sleeping and talking to no one. She is getting happier by the week though and is starting to run, play and gain confidence in herself. When Jolie first arrived, she behaved much like a two year old. Fortunately, she has started to mature again and seems to be developing the equivalent of a few months every week or so. Surely by the next newsletter she’ll be a very different little person! Juan Diego is also four years old, and basically grew up in the government foster home since he was abandoned at 6 months of age. He is a very easy kid, who is naturally extroverted and curious about everything that is going on around him. Juan Diego is always pointing everything out and saying or asking it's name. We think he is going to prove to be one of the easier cases we have taken. He is lacking gross motor skills for a child his age, but we think he may normalize with age and lots of physical activity. We are also hoping to take more Special Ed in the near future. Recently, we went to the visit the child welfare agency and were begged to take 6 more very special cases, between 5 months and 4 years old. One of the main reasons is that they have seen how the Special Ed. children we have taken in the past, have ended up normalizing a lot in our care. Plus, it is hard to find orphanages who will keep disabled children after they reach age 18, so these cases will probably end up in a government home all their lives, as they will never become 100% independent. Also, many of the children we took were on up to 4 medications and suffered from many physical problems when they arrived and none is on medication nor do they suffer from those same problems now. The changes in our other children have also been positive; even the youngest of our children give these special children so much affection and love. It has really opened our kids’ hearts to love and care for others who need their love, as well as to receive love from all of us. The biggest thank you to everyone who has stuck with us in an effort to help our children live a new life!